Bison Rashawn Browne (#4) forces past Pronghorn Cameron Fischer (#4) to the hoop during Manitoba's 91-69 win over the Pronghorns on Saturday, Jan. 5 at the Investors Group Athletic Centre. Photo by Joe Oczerklewicz. If the University of Manitoba basketball teams’ New Year’s resolution was to not lose, they are off to a good start. Both the Bison men and women pulled off sweeps of the University of Lethbridge Pronghorns this weekend. The women have now won eight of their last nine games and sit above .500 for the first time in a long time. The men have now won five straight. The story of the weekend for the Bisons was Nicole Konieczny. The third-year guard put up a ridiculous 41 points in the 82-59 victory over the Pronghorns on Saturday. Her 41 points are the sixth most in a Canada West women’s basketball game, just eight off the record. For head coach Michele Sung, her performance does not come as much of a surprise. The win on Saturday was the second win of the weekend, after the Bisons dispatched the Pronghorns 87-73. Friday’s game was all about Taylor Randall. She scored 28 points, including 15 from beyond the arc, which made the difference. Heading into the weekend, the Pronghorns were tops of the Canada West, but the Bisons managed to make quick work of them this weekend with their aggressive defence and clinical offence. Earning the sweep is nice for Sung, but the Bisons can’t get too wrapped up in it. “The nature of our league is we can enjoy it for about two, three hours then we got to get on to the next one,” she said. Over the holiday break, the Bisons went to Toronto and played a few scrimmage games against Ryerson and York Universities, which helped prepare the herd for the second half. The trip came at a bit of a cost as the Bisons were without a few players, including sophomore forward James Wagner, who is a key cog for Manitoba offensively. The injury-riddled Bison team managed to come away 94-84 winners on Friday, putting up their highest point total of the season. It was Rashawn Browne leading the way for the Bisons with 19 points, seven rebounds, and eight assists. Browne even pulled a rondo out in the second quarter, then faked a behind-the-back pass and sunk the easy layup giving the Bisons a commanding 39-17 lead. 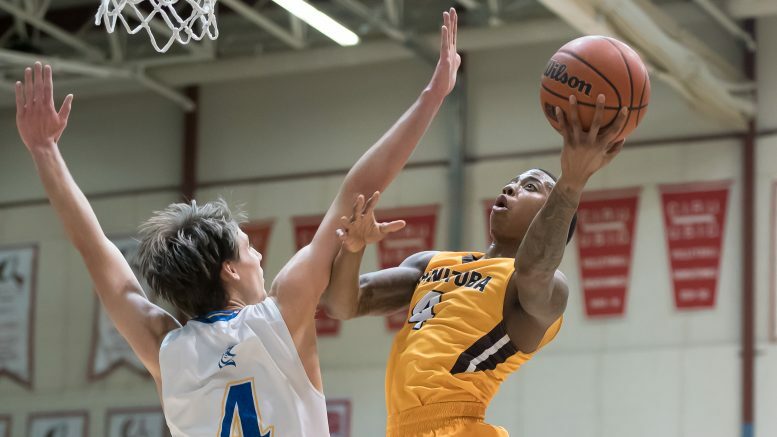 Justus Alleyn had another good night offensively, scoring 23 points which puts him in the top 45 in Canada West career conference points with 1,346. Saturday was a bit of different story, as Manitoba held Lethbridge at bay for most of the game, winning 91-69. Offensively, the Bisons were able to spread the love around with four players scoring 14 or more points. Alleyn again scored 23 points, but Joey Nitychoruk, more commonly known as “Joey Nitro,” had a great game, scoring 18 points, one assist, and eight rebounds. “I think Joey played one of his best games in probably a couple months, which is great,” Schepp said. Bison basketball teams stay at home next weekend to face the University of Victoria Vikes on Jan. 12-13.